Steal yourself away to a place of tranquility and beauty … where the sunshine is everlasting, and the sea a Mediterranean blue… to a smile as warm and welcoming as the sun itself. Surround yourself in a truly unique environment of exquisite flowers and cool waterscapes. Here your every request is granted with pleasure. Set in a location that gently unites land with sea. The Golden Bay Beach Hotel is an exclusive 5 star luxury hotel, set in mature landscaped gardens on the beautiful island of Cyprus. 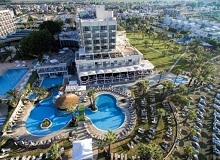 Perfectly situated at the edge of Larnaca tourist area, along a fine sandy beach with crystal clear waters, the resort is just 10 km from the city center and 15 km from Larnaca International Airport. 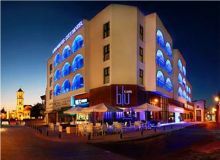 Situated just 100 meters from the famous Larnaca Seafront, right in the heart of the beautiful city of Larnaca and surrounded by lots of cafés, pubs, restaurants and tavernas, this hotel is a good choice for business travellers and holiday makers.